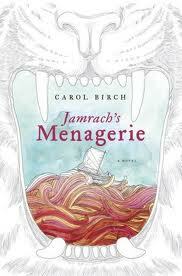 Jamrach’s Menagerie is a historical novel that reads like a classic boy’s adventure novel. It’s full of seafaring adventure and written in an antiquated poetic prose, reminiscent of Dickens and Robert Louis Stevenson. After an encounter with a tiger in the streets of London, circa 1880s, young Jaffy finds himself forever linked with naturalist and exotic pet dealer Charles Jamrach (a real life person). Jaffy starts as an employee of Jamrach, mostly mucking stables and caring for the wild creatures in the shop. Eventually, he signs up for mission to collect a Komodo Dragon for one of Jamrach’s clients. The novel mostly follows the events of that voyage, which range from wonder to pure terror. The novel almost becomes a literary horror novel, after some serious mood whiplash. Birch captures Jaffy’s first person narrative perfectly. The sights and smells of London and the sea come vividly and sensually to life. While the secondary characters are kind of flat, it is more than made up for by richly descriptive world-building Birch does. The book maintains the sense of wonder you get from classic seafaring adventure texts. « An incisive review of BEREFT.